"Closure By Cards", known as "Endless Rebellion" in the Japanese version, is the one hundred and forty-fifth episode of the Yu-Gi-Oh! ARC-V anime. It first aired in Japan on March 5, 2017, and in Australia on April 22, 2018. When Yuya arrives in the Fusion Dimension, he witnesses Shay attacking Leo Akaba. Still grieving over the loss of his sister and best friend, Shay now turns his fangs against Yuya, who used to be Zarc. At the start of the Duel, the Field Spell Card "Crossover" is activated, as per the rules of an Action Duel. It will allow the players to use Action Cards, but they may only have one in their hand at a time. Shay Normal Summons "Raidraptor - Rudder Strix" (0/1600). As it was Normal or Special Summoned, Shay activates the effect of "Rudder Strix", inflicting 300 damage to Yuya. Yuya finds and activates the Action Card "Acceleration", which would reduce the damage to 0, but Shay finds and activates the Action Card "No Action", negating the effect of "Acceleration" and destroying it (Yuya: 4000 → 3700 LP). Shay Sets a card. Yuya activates "Performapal Odd-Eyes Light Phoenix" ( 3) and "Performapal Odd-Eyes Unicorn" ( 8) in his Pendulum Zones. He then Pendulum Summons "Xiangsheng Magician" (500/1500) and "Odd-Eyes Pendulum Dragon" (2500/2000), both in Attack position. Yuya activates the effect of "Xiangsheng", allowing him to change its ATK to that of a monster he controls until the End Phase. He targets "Odd-Eyes" ("Xiangsheng": 500 → 2500 ATK). "Odd-Eyes" attacks "Rudder Strix", but Shay activates his face-down "Raidraptor - Risky Flight", allowing him to prevent the destruction of a Level 4 or lower "Raidraptor", halving the battle damage, and ending the Battle Phase (Shay: 4000 → 2750 LP). As it was attacked, Shay activates the effect of "Rudder Strix", allowing him to Special Summon two "Raidraptor" monsters from his hand. Shay Special Summons two other copies of "Rudder Strix", both in Attack Position (0/1600). As they were Special Summoned, their effects activate, inflicting 300 damage to Yuya for each (Yuya: 3700 → 3100 LP). Shay overlays his three copies of the Level 4 "Rudder Strix" to Xyz Summon "Raidraptor - Rise Falcon" (100/2000, ORU: 3) in Attack Position. Shay activates the effect of "Rise Falcon", detaching an Overlay Unit (ORU: 3 → 2) to increase its ATK by the combined ATK of all Special Summoned monsters his opponent controls until the End Phase ("Rise Falcon": 100 → 3100 ATK). The effect of "Rise Falcon" allows it to attack all Special Summoned monsters Yuya controls. It attacks and destroys "Odd-Eyes" (Yuya: 3100 → 2500 LP). Yuya finds a Action Card and "Rise Falcon" attacks "Xiangsheng", but Yuya activates the Action Card "Miracle", allowing him to prevent a monster from being destroyed by battle and halving the battle damage. Shay finds and activates the Action card "Encore", allowing him to copy the effect of an Action Card in his Graveyard. Shay uses the effect of "No Action", negating and destroying "Miracle". Yuya finds and activates another copy of "Encore", and copies the effect of "Miracle" (Yuya: 2500 → 1200 LP). Shay Sets two cards ("Rise Falcon": 3100 → 100 ATK). Yuya Pendulum Summons "Balance Magician" (1500/???) from his hand, and "Odd-Eyes" (2500/2000) from his Extra Deck, both in Attack Position. "Odd-Eyes" attacks "Rise Falcon". As a "Raidraptor" Xyz Monster was attacked, Shay activates his face-down "Rank-Up-Magic Battle Up Force", allowing him to Xyz Summon a "Raidraptor" Xyz Monster that is two Ranks higher, using the attack target as the Overlay Unit. Shay overlays "Rise Falcon" to perform a Rank-Up Xyz Evolution and Xyz Summon "Raidraptor - Revolution Falcon" (2000/3000, ORU: 3) in Attack Position. As it was Xyz Summoned, Shay activates its effect, allowing him to destroy a Special Summoned monster Yuya controls and inflict damage to him equal to half its ATK. He targets Odd-Eyes. As Shay Special Summoned a monster, Yuya chains with the effect of "Balance Magician", allowing him to decrease the ATK of a monster Shay controls and a monster he controls by 1000. He chooses "Revolution Falcon" and "Odd-Eyes". ("Revolution Falcon": 2000 → 1000 ATK; "Odd-Eyes": 2500 → 1500 ATK). The effect of "Revolution Falcon" continues and "Odd-Eyes" is destroyed (Yuya: 1200 → 450 LP). As an "Odd-Eyes" monster was destroyed, Yuya activates the effect of "Odd-Eyes Lancer Dragon" from his hand, allowing him to Tribute an "Odd-Eyes" monster or two monsters he controls to Special Summon it. He Tributes "Xiangsheng" and "Balance" to Special Summon "Lancer Dragon" in Attack Position (3000/2000). Yuya activates the effect of "Lancer Dragon", sending and "Odd-Eyes" monster from his hand or Deck to the Graveyard to negate the effects of a monster Shay controls. Yuya sends "Odd-Eyes Saber Dragon" from his Deck to the Graveyard to negate the effect of "Revolution Falcon". "Lancer Dragon" attacks "Revolution Falcon", but Shay finds and activates the Action card "Evasion", but the effect of "Lancer Dragon" prevents Shay from activating Spell/Trap Cards when it attacks. "Revolution Falcon" is destroyed (Shay: 2750 → 750 LP). Since a Xyz Monster was destroyed by battle, Shay activates "Rank-Up-Magic Doom Double Force", allowing him to Special Summon a "Raidraptor" monster that was destroyed by battle, then Xyz Summon another "Raidraptor" Xyz Monster with twice its Rank by using that monster as the Overlay Unit. Shay Special Summons "Revolution Falcon" and overlays it, performing a Rank-Up Xyz Evolution to to Xyz Summon "Raidraptor - Final Fortress Falcon" (3800/2800, ORU: 1) in Attack Position. Yuya Sets a card. "Final Fortress Falcon" attacks "Lancer Dragon", but Yuya activates the effect of "Lancer Dragon", allowing him to return an "Odd-Eyes" monster he controls to his hand to prevent "Lancer Dragon" from being destroyed by battle and reduce the battle damage to 0. Yuya returns "Odd-Eyes Unicorn". Shay activates the effect of "Final Fortress Falcon", detaching all of its Overlay Units ("Final Fortress Falcon": 1 → 0 ORU) to banish "Raidraptor" Xyz Monsters from his Graveyard and let "Final Fortress Falcon" attack a monster again for each monster banished. Shay banishes "Rise Falcon" and "Revolution Falcon" from his Graveyard to let "Final Fortress Falcon" attack twice. "Final Fortress Falcon" attacks "Lancer Dragon" again. Yuya activates the effect of "Lancer Dragon", returning "Light Phoenix" from his Pendulum Zone to his hand to prevent "Lancer Dragon" from being destroyed and reducing the damage to 0. "Final Fortress Falcon" attacks "Lancer Dragon", but Yuya activates his face-down "Cross Damage", inflicting the same amount of battle damage to Shay. Yuya then activates the second effect of "Lancer Dragon", sending two "Odd-Eyes" monsters from his hand to his Graveyard to prevent its destruction by battle, halving the Battle damage and inflicting the same amount of damage to Shay. Yuya sends "Light Phoenix" and "Unicorn" from his hand to the Graveyard (Yuya: 450 → 50 LP; Shay: 750 → 0 LP). 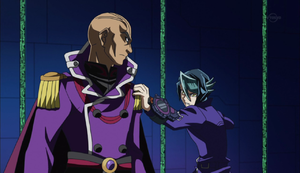 Shay's motivations are changed significantly in the dub; in the original, he Duels Yuya after letting go of his hatred for Leo because he feels that Dueling is all that he has left. In the dub, after empathizing with Leo over their shared loss and the deeds they committed to regain their loved ones, he Duels Yuya to get revenge for Yuto and Lulu's apparent deaths, blaming him for Zarc's revival. Alexis Rhodes appears to be more aware of Shay's capabilities in the dub than she is in the original. According to "V Jump" preview for this episode, "Raidraptor - Vanishing Lanius" was supposed to be used in this episode, but it didn't appear and instead a new card "Raidraptor - Rudder Strix" was used. This page was last edited on 5 June 2018, at 03:04.